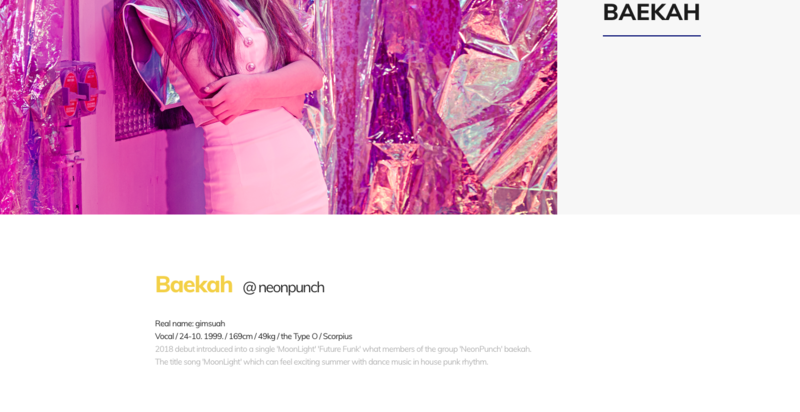 NEON PUNCH (네온펀치) is the first girl group from A100 Ent. 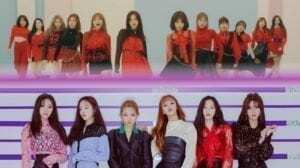 In March 2017, A100 announced that they would be doing a girl group project and a boy group project. After that A100 Ent started posting covers on their YouTube of their girl group. While they did the covers they were always masked and their identities secret. 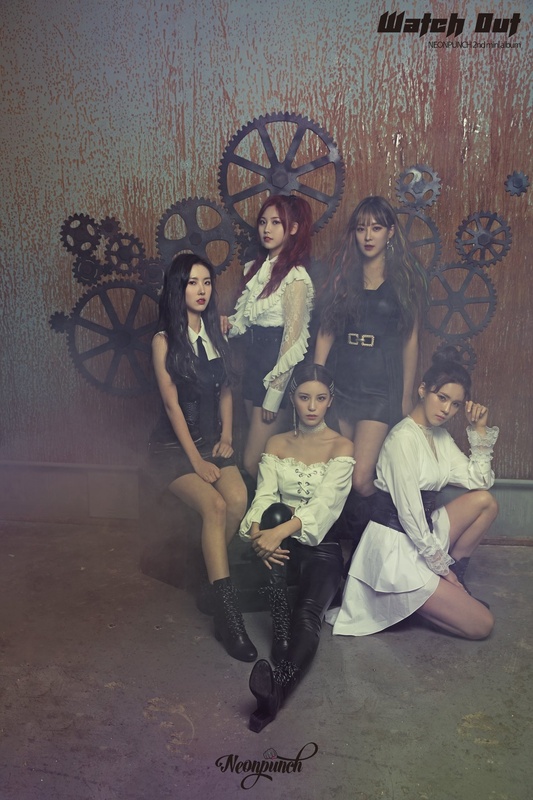 The group debuted on June 27, 2018 with ‘MOONLIGHT’.they are also debuted in China with the Chinese version of “MOONLIGHT”. 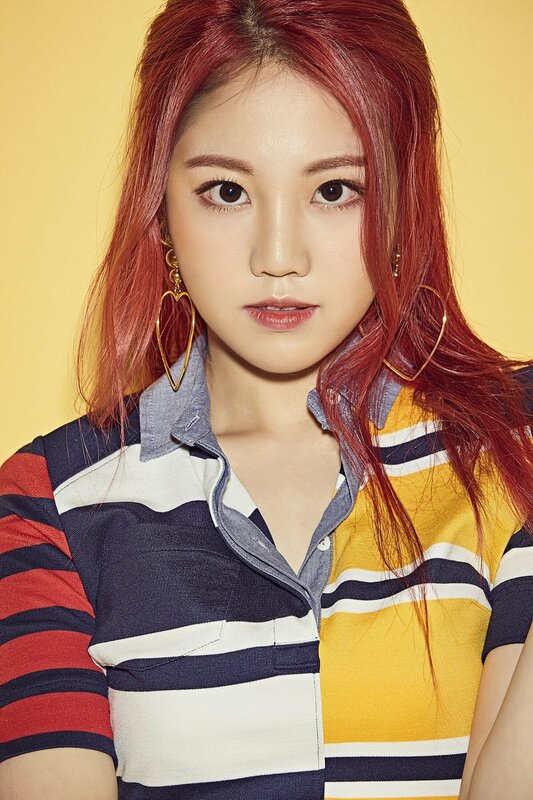 – Daeyon says she’s a cheeky unexpected leader who has a greed for ad libs and gags. – Her hobby is watching Mukbangs (food broadcasts) and Dramas. – When Dayeon is serious she’s really serious more than anyone. – Her favorite food is pork belly. – Her waist size is 19.8 inches. – She says that she’s in charge of gags in the group. – Her role model is IU. – She auditioned for MixNine, but unfortunately didn’t pass the auditions. – She was born in Iksan, North Jeolla Province, South Korea. – She is currently studying at Korea Arts & Culture school. – Her hobby is leaving her perfume scent everywhere. – A cool city girl? An ice princess? If you thought so then NO! – A secret: she doesn’t like shopping. – Her favorite food is beans. – She has a 4D personality. – Baekah participated on Mix Nine and she ended up on the 22nd place. – Her hobby is playing the guitar. – May is in charge of reactions in Neon Punch. – A secret: she knows 3 secs before her stomach rumbles. – Her favorite food is Bibimbap. – Her role model is Sunmi. – Her motto: Let’s work hard. – Her hobbies are sleeping and eating delicious food. – Iaan has a pure charm. – A secret: she’s good at push-ups. – Her favorite food is Spicy stir-fried pork with rice. – Iaan’s favorite color is blue. – Iaan and May are the Beagle Maknae Line. – Her role model is HyunA. 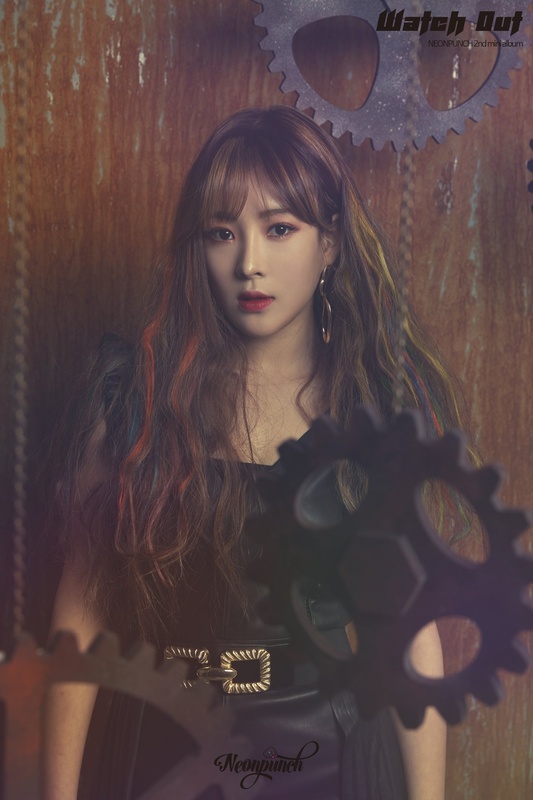 – She was added as a new member in January 2019, after TERRY left the group. – Her hobbies are cleaning and organizing. – She always wakes up the earliest and wakes the members up so they don’t be late. – Terry is a very passionate girl with a lot of spirit. – A secret: she’s good at petty tricks and she doesn’t like games. 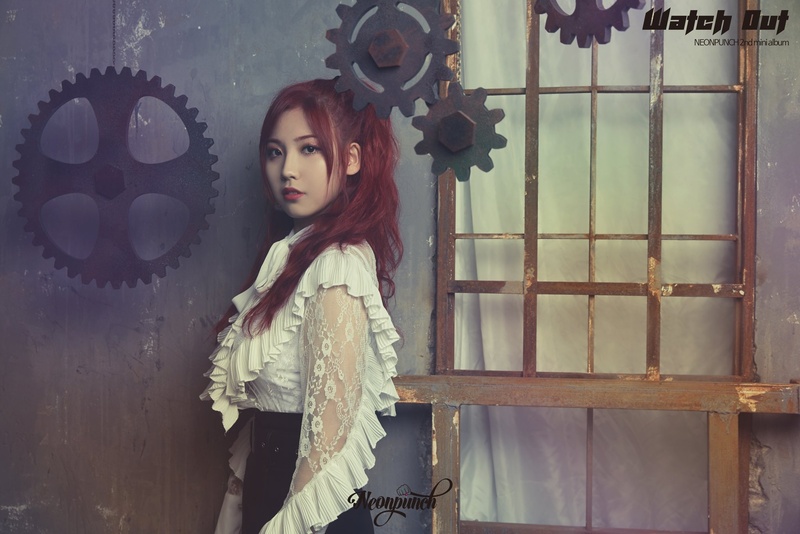 – She is a former member of Sunny Days (disbanded). – Her role model is SNSD’s Taeyeon. – In October 2018 Terry went on hiatus due to health reasons. 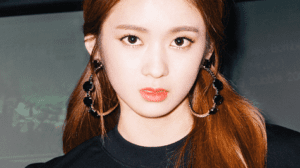 – She officially left the group on January 17th 2019, when her contract expired, due to health reasons. – The mood maker of the group. – Her motto: “Let’s be positive”. – Her hobbies are shopping and collecting cosmetics. – She can play the flute. – She’s good at rapping. – She likes editing images and playing basketball. – The body part she’s most confident in, are her legs. Who is your Neon Punch bias? I think Iaan is very pretty. Yea I’m confused. Can someone explain pls?? Terry was Sunny Days’ former member as Dasom. 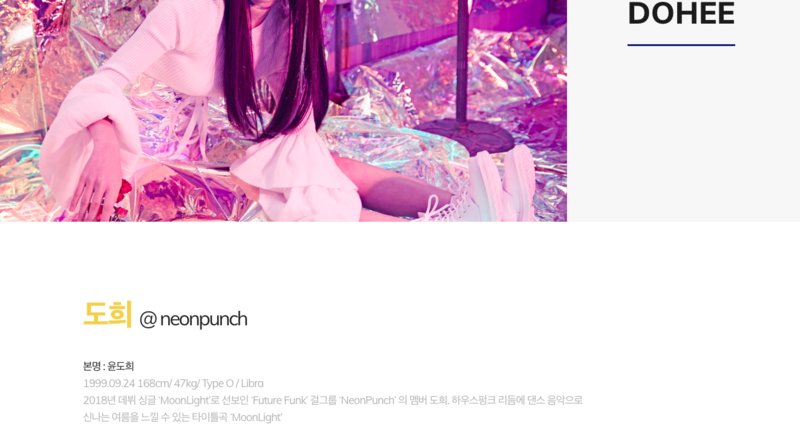 Terry has been on hiatus ever since early October 🙁 the reason is unknown but she has not appeared in anything from NeonPunch’s social media and she is no longer included in their hashtags. 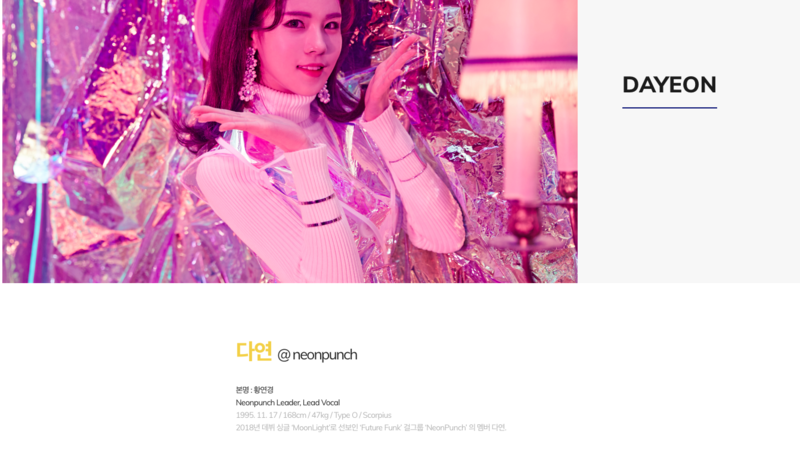 Terry is leaving Neonpunch and a new member is being added named Dohee. Please add Dohee, I wanna know more about her!! one older brother and one older sister. Based on their new album, May is the Lead Vocalist of the group. have they ever mentioned a visual member position? She was born in Busan, South Korea. She was born in Iksan, North Jeolla Province, South Korea. She was born in Gwangju, South Korea. She was born in Daegu, South Korea. Actually Dayeon is Lead Vocalist (on official website), so May is Main. Also Dohee’s date of birth is September 24, 1999. Baekah is also only a vocalist. This should be there fixed position. wait who’s arang and hajeong??? are they members??? 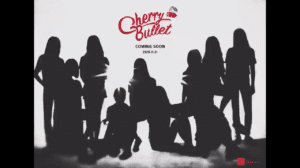 if so why arent they promoting with neonpunch??? positions are on their official website and Dayeon is listed as lead. Hi! This is how their positions are listed on the Makestar project for their new comeback. 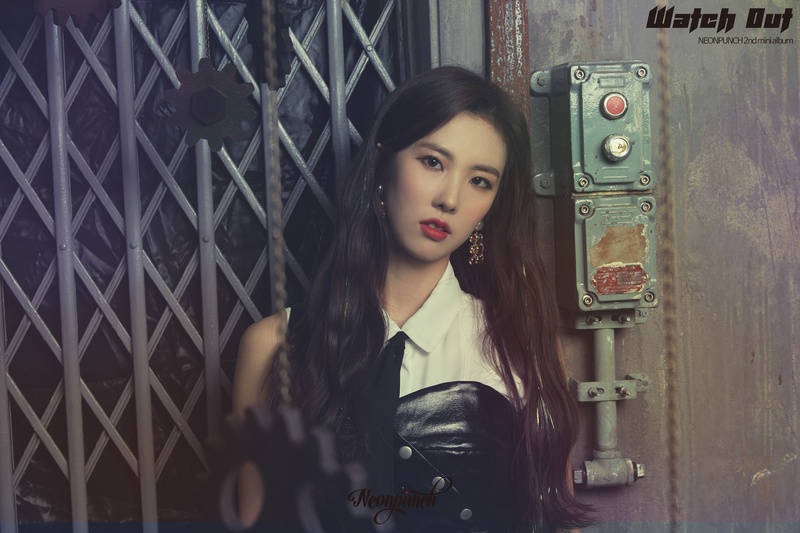 I think she’s listed as lead vocal on their website bc there isn’t always a difference made between main and lead vocal in Korea, like how for Oh My Girl, Seunghee and Hyojung are listed as the lead vocals on their website but they have introduced themselves as both the main and lead vocals. But anyway, based on the profiles provided here, I think it’s safe to say Dayeon is the main vocal and if there’s a lead vocalist, it’s May.